Over 50 years and one of the oldest privately owned sports goods shop in New Jersey. Supplying hard goods and apparel. 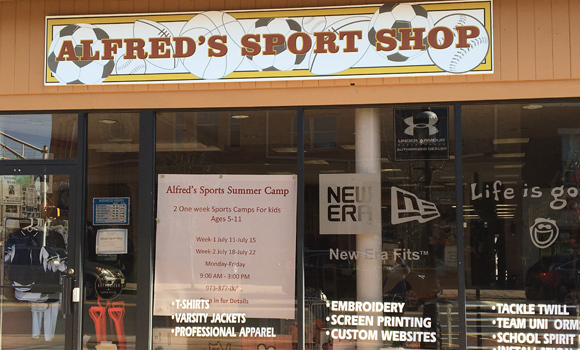 Alfred’s Sport Shop is Northern New Jersey’s leading dealer of sports gear, team uniforms, and varsity jackets. A pioneer in fundraising website sales, Alfred’s offers personalized websites for teams, schools and various organizations. Offering in house personalization alongside partnerships with areas best screen-printers and embroiderers, Alfred’s is your one stop shop for small orders to bulk sales. Alfred’s Sports Shop carries all major brands in hard sporting goods and sporting apparel. At Alfred’s, we prides ourselves on our quality service and years of experience. We have a huge following of baseball, softball, football, basketball, soccer, lacrosse, field hockey just to name a few. As well as these, we service many colleges, high schools, elementary schools, travel leagues and recreation departments as well as corporate and community sponsored groups. 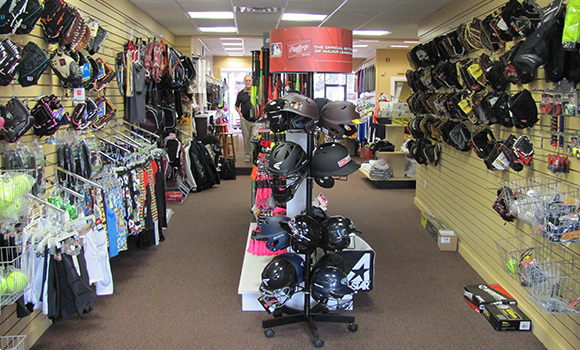 Alfred’s Sports Shop, has established themselves as one of the leaders in the Sporting Goods Industry in New Jersey. We would like to invite you to visit us, as we firmly believe that we will quickly become your community destination that provides comprehensive solutions to your sporting needs. As you will quickly see, Alfred’s is Where SPORTS Happens.